My name is Andrea Griffini and I was born in 1966 in Vigevano (a small town of about 60,000 in Pavia district). I got my highschool diploma in computer science and I've a degree in pure math. I've been always in Vigevano excluding during high school (I got my diploma on the beautiful Lago Maggiore, in Verbania Intra) and a period of about one year during which I was living in Los Angeles. I like chess, karate, ski, music (I like playing the piano ) and, of course, computer programming. 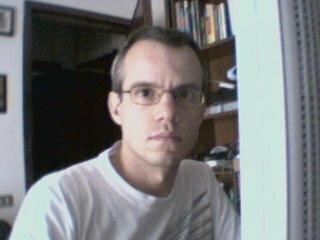 I spend a lot of my free time on my computer writing programs; but also on ICQ (16-851-219) and playing chess with other people from the internet with the nickname 'agri' on Internet chess club , www.playchess.com and every now and then even on freechess.org . I'm currently an employee of COMELZ of Vigevano and my occupation is mainly writing control and support software for the industrial machines the company produces. 6502 is the name of the first microprocessor I ever programmed (Apple ][, '82) and is also my nickname since I've got the IRC disease. I know it's not a great nickname but at least this means I don't have to fight for my nick when getting online. Quite often someone hits this site looking for infos about the 6502 microprocessor; getting angry because of the absence of anything related to the micro (excluding my devotion). I've lately tried to fix this problem writing a 6502 emulator and a very rough Apple ][ emulator to test it.